10 Item Wardrobe? My 60 Item Minimalist Wardrobe? This may seem like a trivial topic, but of course everyone must wear clothes and having a good relationship with them can really affect our life. This topic is important to me because clothing is so over-consumed and wasted in the western world. I’m hoping that this article could be useful to everyone, not just digital nomads. Statistics show that most people in the UK waste a lot of clothing, so minimizing your wardrobe could save you money, time, and help the environment. 80% of my wardrobe. It’s impossible to show all of it, since it’s never ALL clean. 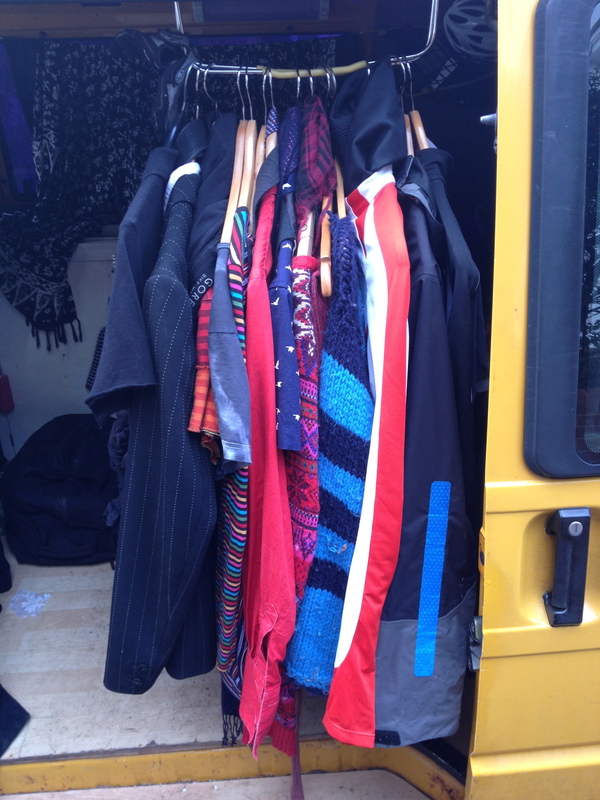 In a van everything must be hung up so it doesn’t go mouldy. I fashioned this rack from the handles from a supermarket shopping basket. They don’t seem to live in cold buildings or go outside much – where are all their layers? They obviously have constant access to washing & drying facilities. How else can someone only own 1 set of sports clothes? So, those of you who it may help, here’s the inventory of my wardrobe. It works for a wide range of climates, situations and activities. There are 60 items in total, covering all seasons from -2C to 35C. Things like socks and pants are counted as 1. In bold are my 10 core items for winter, which obviously change in summer. In italics are things I’m considering giving away. On an environmental note, apart from underwear and sports-clothes, 95% of my wardrobe is 2nd hand or home made. Since I’m able to sew, I repair things, extending their life by more than half. My hope is that posting my 60 item wardrobe will help to show more people, not just minimalists, how to keep a smaller collection of garments. Here are few of the systems and methods that make this wardrobe work. Even though it’s big my minimalist standards, it’s minimal. Two week’s supply of everything for each season: This tides me over when I can’t get to wash my clothes. Very temperature specific clothes: I even have different thicknesses of t-shirts for summer and winter. Basically I can’t afford to get too hot or cold. Too cold & if I’m in my van, I won’t have a source of heat to get warm again. Too hot and I’ll sweat more meaning having to change my clothes more often, causing a washing crisis. Clothes for every occasion: I used to shun smart clothes, sports clothes, or pyjamas, but over the years I’ve recognised them as necessities. Owning a few smart clothes stops people from thinking I’m a dysfunctional vagrant. Since I exercise a few times a week, sports clothes do the job better and help avoid a washing crisis. Pyjamas are necessary for when I stay with friends. Avoid Synthetic Fabrics: They aren’t warm or breathable. They also smell quickly. I’ve shelled out the extra cash to buy merino wool clothes for winter. Wool doesn’t need washing often, dries quick and is very warm. It wears faster if layered directly, so cotton has to go in-between. Where I’ve chosen synthetics, such as for sports clothes, they must say “breathable” on the label. I have 1 synthetic outfit that dries so fast it can be worn straight out of the washing machine – for emergencies. Exciting clothes, all the time: As a performer, I think it’s important to look interesting & different, but I don’t have separate clothes to perform in so this becomes how I always look. I like bright, strong colours and it boosts my mood to wear them. Although I always wear trousers, what I wear on my top half can be very versatile. I dress like a box of crayons. However, once my folk band played at a very formal wedding and stood out a mile! So I got myself a discreet pinstripe suit and white shirt for such events. So that’s it – my token practical minimalist post. Here are all the clothes I own – Total 60 items. In 2012 I lived in a Yurt for 6 months. Come winter I upgraded to also renting the smallest room in the attached house for reduced rent, so as to give me a warm indoor space. I kept this arrangement, whilst working part time as a music teacher, until the end of 2013. 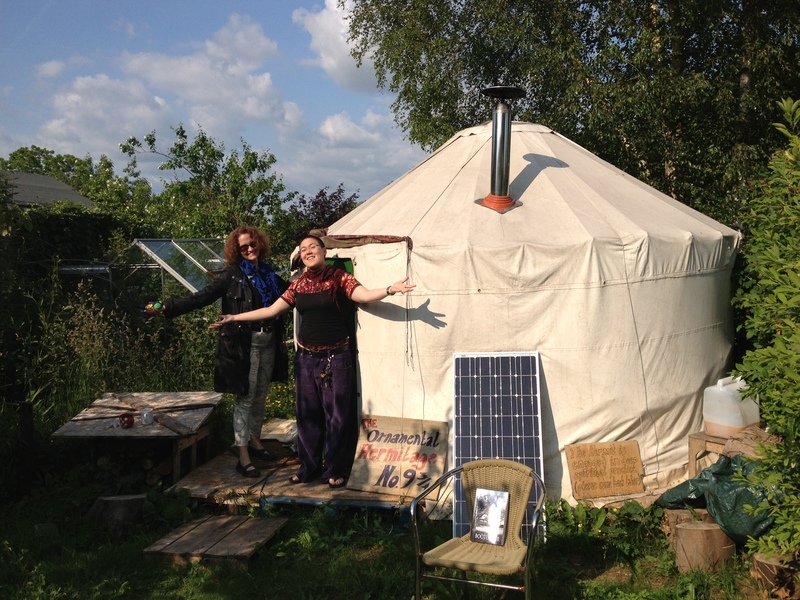 At that point I moved out of the yurt & room, sold the yurt, began a semi-nomadic 2014. I started to phase out my teaching work, couch surfed, house-sat, stayed with friends, bought a van, stayed in the van, borrowed living rooms as practice & recording spaces, used short term lets etc…. To survive comfortably on a lower income so I could work less and have more time to be creative as a singer-songwriter. To have access to spaces to practice & record, without having to pay recording studio fees, or own my own soundproof room. To live a more ecological lifestyle. I simply wanted to lead a rich life. If I could live on less money, travel at will and not have to worry about rent, it would be just like being rich, but without the stressful city job that usually goes with it. I wasn’t willing to accept a recession-governed lifestyle that would sap all my creative energy and ability to contribute positively to the world. Apparently, this sort of process of seeking alternatives is fashionably known as “lifestyle design”, and the term for the life I have chosen is “digital nomad”. By the end of January I’d decided to buy a van. This was a real kicker for me, since I’d wanted to live ecologically, but a van proved necessary, and still allowed me a comparatively low-carbon lifestyle. However, unable to find one in my price range, I rented from a friend till a van came up in spring. My teaching work had been phased out, leaving me totally unemployed by April. However, I was lucky enough to secure a house-sit for the whole of that month, which allowed me to FINISH RECORDING MY ALBUM, which I hadn’t had time to complete for years. This lifestyle change was really having a positive effect! By May, I was running out of funds. Surprisingly I decided to face my fears surrounding money by allowing it to run out completely before seeking any work. I called it The £0 Challenge. Despite spending much of the summer in the expensive city of London, it was mid June before my cash ran out. I’d learned that my biggest resource was people and their kindnesses, not money. With the right communication, I could exchange favours for what I needed, use things others discarded, or spaces they’d left empty (house-sitting). To gain some cash, it was time to release the album I’d recorded earlier in the year – Refraction & Redemption. 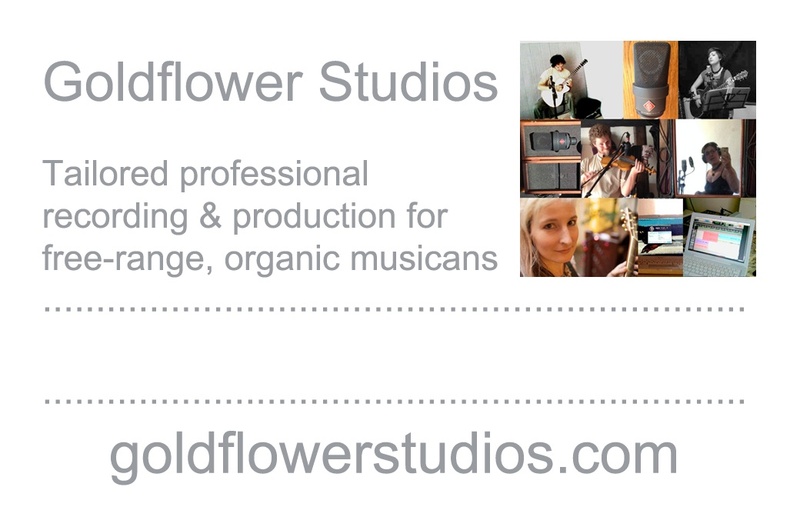 Doing this through Kickstarter, the release left me with over £2k pledged which I put towards Goldflower Studios. 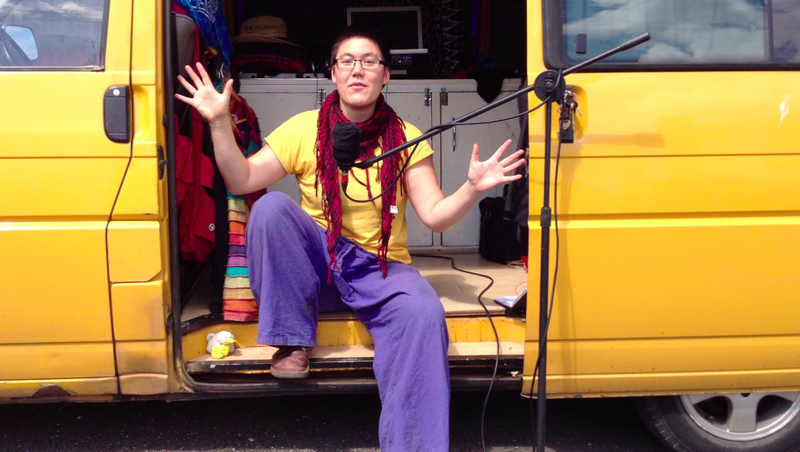 This is my tailored mobile recording studio for unsigned, free-range, organic musicians, which was launched at the end of August. By this point, the Exeter Secret Gigs movement had evolved as a spin off from my “living room gig” album release. People loved the format, describing the evening as magical, and wanted more. I organised 2 more “Secret Gigs” in 2014, which were defined as “unplugged, listening gigs in alternative spaces”. There will be more to come! As winter drew near, unwilling to busk in the cold, I began to seek digital nomad work (working from my computer using the Internet). To my shock, the college I’d previously taught at took me on for a mixture of Course Writing, 2nd Marking and Skype tutorials. Even better, the most work is in January – right when gigs are at their quietest and most musicians scratch around for income. Just before Christmas I completed crowd-sourced music video for YouTube, featuring various people “Standing On The Edge” of stuff. Before 2014, making a music video seemed like a pipe dream. Where would I source thousands for the filming? Yet, living in a different way helped me think differently about everything. This helped me see that the music video was possible without the thousands or the film crew. It’s hard to believe how productive this year has been even though I’ve had less money or stability than ever before. Even though, at times I’ve been incredibly frustrated to have nowhere to keep my stuff or set up a permanent studio, it’s been worth it overall. Eliminating the weight of rent and a regular job from my life has allowed me to follow through and make my dreams come true! I’m not saying all this to boast – I’m saying, you can do it too. 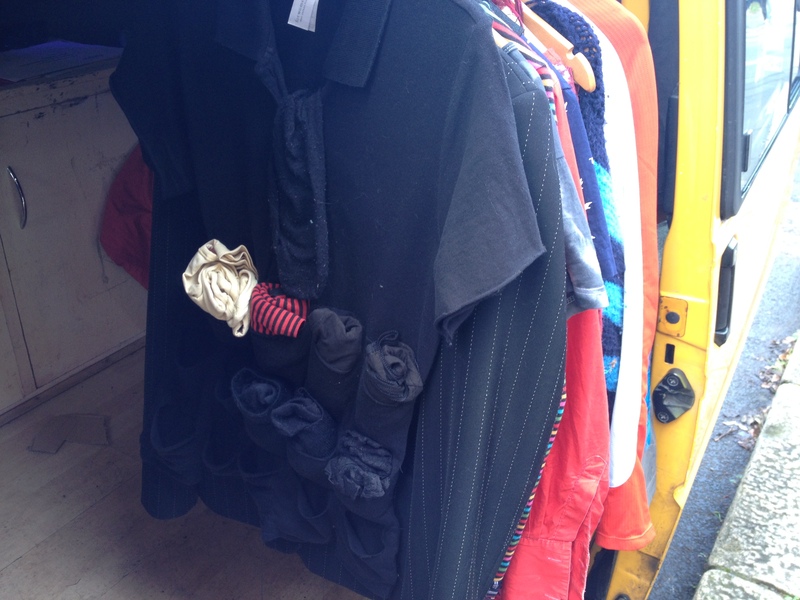 I don’t mean you have to fold your life into a van like me, but never give up on thinking of alternatives. Just because everyone is doing things one way, doesn’t mean that’s the best way to do it. How could you improve your life by doing something differently?